It’s my Mother and Father in law’s Golden Wedding Anniversary next week and to celebrate we ‘kids’ the 3 boys, 2 wives and 3 grandchildren are taking them away for a family holiday in the Isle of Wight. 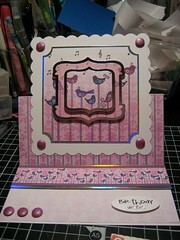 I have made this 8 x 8 easel card for them. They are both wildlife lovers and Mum is keen on owls, so I had to use these lovely gold outlined ones from Craftwork Cards. I am thrilled with the finished card and it’s no great surprise that it is – yes – yet another easel card for the collection. There’s nothing like running with a theme is there? I was so pleased with my first easel cards that I am now well and truly hooked. This card was made using the Hunkydory Little Tweets set that I purchased in yet another weak moment from Create and Craft. 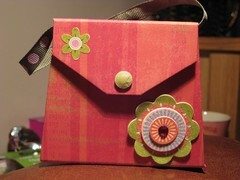 I have teamed it with some bits and pieces from my ever growing collection of Craftwork Cards bits and pieces. I was so pleased with this one that I made another almost the same which you can find in my Flickr page by clicking on this image. My next job is to make a Golden Wedding card for my in laws and am planning…you guessed it, another easel card. This time it will be 8 x 8. 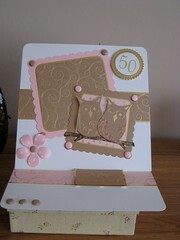 I have an idea brewing involving the lovely craftworkcards owls. Watch this space. 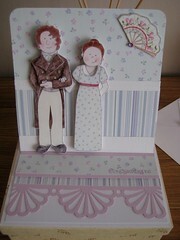 Darcy and Miss Bennett Engagement card. Today I finally got round to making an easel card. I have seen them and received a lovely one for my Birthday, so now, here are my offerings. This one is an engagement card, the recipient is apparently a real Jane Austen romantic and I knew instantly I had the right thing for it in my stash. I used my scor-it board to make the embossed dado rail and skirting board, the papers were ones I have had in my stash for a while and the border is a Martha Stewart border punch. In addition to this one I made two other easel cards today, a football themed one for my father-in-law’s Birthday and a lady in the bath for a good friend, using a scalloped oval punch to make the bath mat to prop the front of the card up. I think I can safely say these won’t be the last cards I make in this style. As promised, here are the results of the workshop I attended yesterday. Run by one of the other members at my lace group we had a really good time and I even managed to finish my box with a little time to spare. Just enough time (and leftover paper) to make yet another little post-it pad. The box is made from the same mount board as the little books although is considerably more complex to put together. Our lovely tutor had completed a bit of the construction for us to give us the best chance of finishing in the time. It has an octagonal lift out tray and is covered in wallpaper using pva glue. Getting the box parts covered neatly is a little tricky and with the pva glue is a pretty sticky process too. I am however thrilled with my box, now I just have to decide what to use it for. As always, click the pic to see more images. Getting a bit hooked on these little notebooks now. I have further adapted my original cover design to make a magnetic snap closure handbag shaped book. I’m pretty pleased with how this handbag shaped card came out and although it is a bit more fiddly than the straightforward square pad I think I shall be making more of these as presents. It still needs a couple of little tweaks when covering with paper to tidy up some of the corners but it’s definitely getting there. Click the image to go to more that I have made. 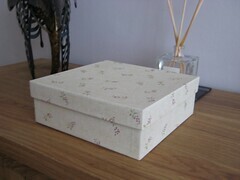 Tomorrow I am attending a box making workshop, am looking forward to that. Look out for the pictures of that project soon.